Summary: C&I can be profitable and help diversify your loan portfolios. We look at some ways to capture this business. As you eat your breakfast this morning, consider something. 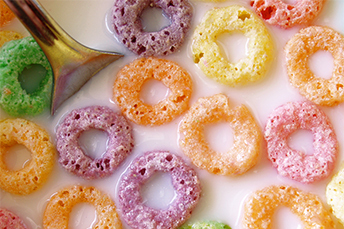 The ring shaped pieces in Froot Loops cereal are bright and different colors (green, orange, purple, yellow and red). Yet, despite the different colors, they actually all are exactly the same flavor - a blend of fruit flavors. Sorry to splash natural and artificial colors all over your childhood, but even though your brain has been fooled for all those years, we would still say the Froot in the Loops tastes just as good now as it did back then. Since their childhood it seems, community banks have been working to expand commercial and industrial (C&I) lending. After all, C&I can be profitable and help diversify away from commercial real estate (CRE) concentrations. What's not to like? Interestingly, bank C&I lending has fallen 33% since pre-recession levels according to a PayNet study. That said, these higher-yielding C&I loans also bring in additional deposits, and remain profitable due to below-average default rates. PayNet predicts 2018 C&I defaults at 2.1%, which would be lower than the pre-recession long-term average. The key, of course, to capturing more C&I business is to have a robust website portal, which may only be possible if your core supports it. The good news is that beyond basic online website capabilities, newer cloud-based software tools also help bankers on the back end of things. The entire loan process can be automated now using customer relationship management (CRM) systems to help find better prospects, through origination, and even ongoing loan management (including renewals, collateral evaluation, covenant monitoring and compliance). These days there are even software options to automate ancillary processes like populating data from a business customer's annual tax returns for underwriting and ongoing cash-flow analysis. A community banker we know in the Northeast says such tools enable his institution to not only offer C&I loans, but also meet their customers' non-credit needs. These can include such things as cash management and scanning technology for instance. Even better, the bank offers even more personal high-touch service. Emerging technology not only enables community banks to more easily offer C&I loans, but also to do so at a lower cost. For a $100k loan that carries a net interest margin (NIM) of 3.7%, the cost to process such a loan can range from $3-4k. One NY community banker says its online software tools that automate the process reduce costs by up to 50%. When selecting the right C&I software tools, one thing to consider is how easily the system integrates with your existing core banking system. Upcharges can be high, so do the work up front to ensure everything works well together. Beyond nifty software and a robust website of course, C&I lending takes expertise. So, as with any offering, be sure to review this part, along with all regulatory requirements, before you jump in. If originating C&I directly isn't your thing, but you are seeking to augment existing CRE production, give us a call perhaps. PCBB offers Shared National Credits through our C&I Loan Program in loan amounts as small as $1mm. Let us know if you would like more information or read more about it on our website. Wells Fargo just can't seem to catch a break these days. Now the Labor Department is reportedly investigating the bank's 401(k) practices to see if it pushed customers in lower cost plans into more expensive IRAs. Visa and Mastercard are reportedly working together to create a single payment button people can use to make online purchases. The move is designed to simplify the process and help the companies better compete against PayPal. The CFPB has finalized rules that eliminate the time limit requirements for mortgage loans that related to disclosing closing cost increases around Know Before You Owe. A report by Ernst & Young LLC finds almost 90% of large companies say they plan to divest assets in the next 2Ys vs. 40% who said so just 1Y ago. Business leaders are taking this action as they tighten up their strategic focus by selling noncore units and shifting capital to stronger business areas. JPMorgan reports 57% of millennials would change banks for an improved tech platform. Bankrate provides some things to consider around app development: offering mobile lending, more detailed features, enhanced customer usability (i.e. renewing CDs), remote deposit capture, cardless ATMs, extended virtual customer assistance, experimenting with subordinate apps and additional customer card controls. PCBB's enhanced cash letter service for Canadian checks can help your bank minimize its credit exposure, increase operational efficiency and deliver faster fraud notification. Learn more about our check imaging for Canadian cash letter.